The wonderful thing about nonfiction biographies is that, when done well, they will take us on a journey full of facts, stories, and struggles that will not only enlighten us but also keep us glued to the page, even when we know the outcome. The following books we’ve selected to share for Women’s History Month are excellent examples of recent biographies about extraordinary, trailblazing women whose legacies are enduring and whose contributions remain invaluable serving as powerful role models for generations to come. Find out more about Hedy Lamarr, Susan B. Anthony and Ada Byron Lovelace below. 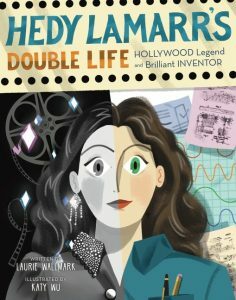 Wallmark’s chosen a fascinating woman to profile in her illuminating picture book biography of Hedy Lamarr. The Hollywood legend was more than dazzlingly beautiful actress, she was a secret inventor whose “greatest invention was the technology known as frequency-hopping spread spectrum” which has played a crucial role in keeping “our cell phone messages private” and keeping our computers hack-free. Although she knew she was more than just her looks, Lamarr chose to hide this talent from public and didn’t sell her inventions. Born in Austria in 1920 (100 years after Susan B. Anthony), Hedy was a curious child who, when other kids would likely be out playing, was pre-occupied with how things worked. Her father encouraged her interest in science and technology which no doubt had a positive impact on the young girl. She also had a love of cinema and pretending so it was no surprise she gravitated towards a career in the movies. “I acted all the time … I was a little living copybook. I wrote people down on me.” Eventually doors opened for Hedy when a famous film producer offered her a seven-year film contract. She left her homeland for the bright lights of Hollywood, had her name changed to Hedy Lamarr from Hedwig Eva Maria Kiesler and went on to star in films with some of the industry’s most popular leading men including Jimmy Stewart and Clark Gable. With her wondering mind at work all the time, even after a day of filming, Lamarr always was thinking about a way to improve on things already in existence or to create something new. That was especially true during WWII. So when she met composer George Antheil, a former weapons inspector, she learned from him that the U.S. Navy, like the European ones, had trouble with the enemy jamming their weapons’ radio signals. Hedy wondered if there was a way to counter this. With the piano as the impetus for a new idea, Hedy thought there might be a way to change frequencies like playing the same keys on a piano in different octaves, and by doing so build a secure torpedo guidance system. And so, after a lot of hard work, they did. Together with Antheil they shared their invention and were told it was “red-hot” but it still needed more work to operate effectively. While the pair eventually received their patent, the Navy “refused to develop” this ground-breaking technology and even classified it as secret so no one else could use the idea. Ultimately they never earned a penny from this breakthrough. Undeterred by her thwarted efforts to help her adopted homeland, Hedy found success by getting behind the war bond effort, selling millions. Lamarr also took time to meet with servicemen at the Hollywood Canteen and pitched in any way she could. She retired From the movie business in the late 50s and only in the last twenty years has been earning the recognition long overdue. Wu’s artwork is just the right amount of subject and space, and pulls us into every illustration, my favorite being the one where Lamarr and Antheil first meet at a dinner party. Her simple depictions of Lamarr’s big green eyes, sculpted nose and brown hair are terrific. Wallmark’s added a “Timeline” and “Secrets of the Secret Communications System” in the back matter for young readers to learn more about “jam-proofing” technology. I love how even the endpapers are filled with artwork and details about Lamarr. 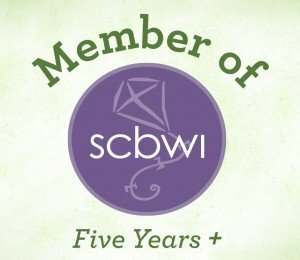 Plus readers will find a “Selected Bibliography,” “Additional Reading About Other Women in Stem” and a list of “Hedy Lamarr’s Films.” Award-winning author Wallmark’s also written picture book biographies about Ada Byron Lovelace and Grace Hopper. Add Hedy Lamarr’s Double Life to the list of must-read biographies. 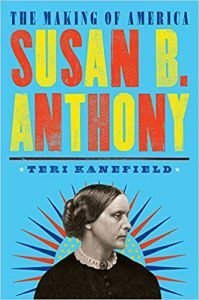 Prepare to be impressed by the tireless commitment and inroads Susan B. Anthony made for women’s suffrage as detailed by Teri Kanefield in Susan B. Anthony: The Making of America, book #4 in this inspiring series in which each volume “tells the story of an American leader who helped shaped the United States” that we know today. My review copy is so dog-eared to mark the countless passages I wanted to return to. What Kanefield successfully does from the Prologue forward is thoughtfully convey the most important aspects of Anthony’s life so kids will see the evolution of her beliefs beginning with her Quaker upbringing, her teaching years and all the way through to her time lecturing across America as an abolitionist and women’s rights activist. 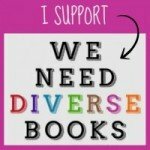 What comes across to the reader is that Anthony, born in 1820, prior to the Victorian era, from an early age held strong convictions that everyone should be treated as equals. At that time in our country’s history women were supposed to raise families and keep their noses out of politics and practically everything else unless it concerned homemaking. They were only allowed to work in a limited amount of jobs: teacher, seamstress or nanny. They were prohibited from owning property and, in the case of estrangement in a marriage, the man gained custody of the children. In fact, it was not uncommon for a man to have his wife committed to an insane asylum if he wanted out of the marriage. The immoral slave trade was the most divisive issue, even among Quakers at that time. To Anthony, people of color as well as women were not second class citizens, destined to remain subservient to white men. This was considered a radical idea in the early 19th century and she did not have an easy path as she tried, along with her friend and fellow activist, Elizabeth Cady Stanton, to bring about change and a new amendment to the Constitution giving women the vote. Frederick Douglass was a friend with whom she worked to help first abolish slavery and then gain constitutional protection for free slaves. However, before slavery was abolished and even after, prominent politicians and leaders cautioned her to put her agenda for women’s rights on hold. This was unacceptable. Anthony, along with her friend and staunchest ally, Stanton, challenged the notion that women had to forgo their wants and needs and remained determined “to ride roughshod over obstacles, ignore critics, and take help wherever they could get it.” The support of Anthony’s large family was a constant throughout her life and I wonder how she’d have managed without them during the numerous times she was broke or in debt. Her intelligence and quick wit made her the ideal person to speak on behalf of the suffrage movement but it’s worth noting that she also gravitated towards defending anyone whose rights were being abused. This well-researched biography is filled with maps, photos, flyers, posters and advertisements that help paint a picture of American society during Anthony’s life. Even something like a lady’s corset could be symbolic of the self-imposed restrictions 19th century women placed upon themselves due to societal norms that a woman should have an hourglass figure. “Girls as young as seven were laced into overly tight corsets.” Also included are Notes, a Time Line, Selected Writings of Susan B. Anthony, a Bibliography, Acknowledgments and an Index. I told everyone about Ada Byron Lovelace after finishing Dreaming in Code. I had heard her name in regards to code but it ended there. I knew nothing of the back story that led to this brilliant woman’s presaging today’s computer era almost two centuries ago! Ada Byron Lovelace was born in England at the end of 1815, just five years before Susan B. Anthony. Augusta Ada Byron, was the daughter of the celebrated poet George Gordon, Lord Byron, and his “prim, religious” wife, Anne Isabella Noel, called Annabella, a woman of wealth and intelligence. The couple did not remain together due to his philandering and squandering of money among other things so Ada, as she became known, was raised by a single mother. Annabella was a self-centered hypochondriac yet quite philanthropic at the same time and left it to nannies, governesses and tutors to raise her child while she spent time away visiting her newly inherited holdings and helping the coal miners under her employ. McCully engagingly details how Ada flourished from her education although she remained removed from society until her mother deemed it necessary to find her a husband. Around this time Ada met Charles Babbage, “famous inventor, philosopher (as scientists were then called) and mathematician” who held Isaac Newton’s chair at Cambridge University. Theirs was to be a long and intense, though completely platonic, relationship as they discussed big ideas since both were passionate about math and science. Their friendship provided Ada with the outlet she needed for stimulation. However things grew complicated when she married William, Lord King who became the Earl of Lovelace and soon became a mother. Though not as cold as her own mother, Ada, too, found it difficult to parent when her loyalties lay elsewhere. These chapters were some of the most fascinating ones yet sad at the same time. She often felt ill and, as was common in the early 19th century, was prescribed Laudanum, a tincture of opium viewed as a cure-all. That addiction had to have contributed to her early death at age 37. As Countess of Lovelace, Ada mixed with a cross-section of society and attended talks on science given by brilliant minds of the era such as Michael Faraday. Ada also wanted to help Babbage and his Analytical Engine and at the same time make her own mark in the science and math fields. Here’s where her genius shone through. While Babbage saw his invention as “arithmetical and numerical, rather than algebraical and analytical,” Ada believed the machine could do more than compute … “that numbers were symbols and could represent other concepts, is what makes Babbage’s engine a prototype-computer.” Sadly, Lovelace lived in era when women were overshadowed by men and women’s freedoms were limited. We can only begin to imagine what miraculous achievements she’d have made had she only lived longer. 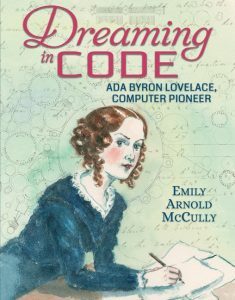 With the very readable Dreaming in Code highlighting her meticulous research, McCully has shed light on Ada Byron Lovelace, an important historical figure whose contributions to the field of STEM are finally getting the recognition they deserve. I recommend this young adult nonfiction book for anyone seeking to get a better understanding of the era in which Lovelace lived and how she was inspired to think outside the box. Read about the friendship of Susan B. Anthony and Frederick Douglass here. 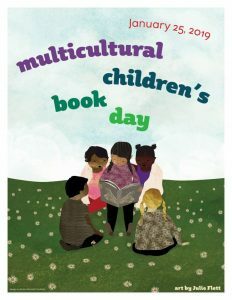 Read another book, Dare The Wind, illustrated Emily Arnold McCully here.